Of all the models in the rugged, all-American Chevy lineup, the Suburban is the choice for those drivers whose philosophy in life and on the road is “Go big or go home.” And this year, the 2016 Chevy Suburban conquers Cincinnati, OH and its surrounding areas with the swagger of a boss. The largest of the Chevy vehicles, the Suburban is ideal for summer adventures and tackling any tasks making up your daily grind. Able to seat up to nine passengers, the 2016 Suburban is characterized by its surprisingly hushed ride, refined interior, and competitive cargo capabilities. Despite its monstrous size, the Suburban actually returns some of the quickest zero to sixty mph times in the segment, measured at 7.2 seconds. 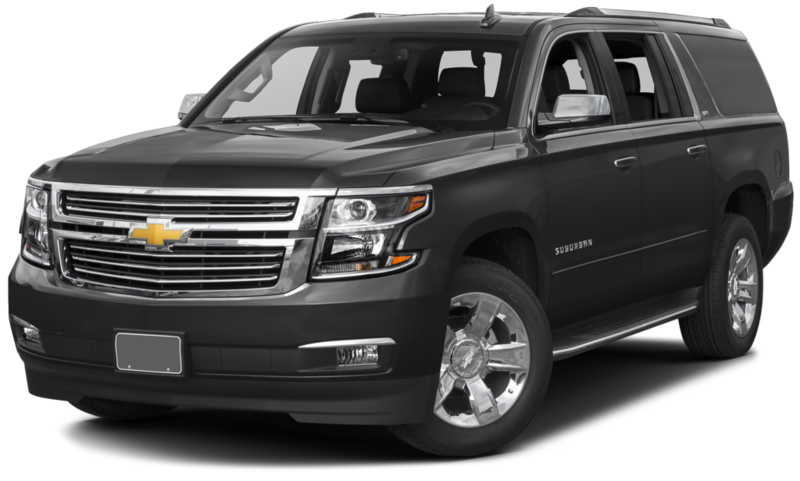 Class-leading models like the 2016 Suburban belong in the inventories of only the most competitive and award-winning bow-tie business, and for the Cincinnati, OH territory, McCluskey Chevrolet is just such an establishment. Whether it’s a new vehicle, like the 2016 Chevy Suburban, or a used or certified pre-owned model, you’re sure to find it at McCluskey Chevy. The sales team will help you target the right vehicle for your needs and preferences, while the in-house financing department ensures that your new, or new-to-you vehicle, is well within your budget. But before you even visit the dealership, take a few minutes to explore McCluskey’s inventory online. For some consumers, taking the time to review the abundance of options before actually setting foot on the lot can make for more confident and targeted shopping. And for that extra boost of confidence with respect to your potential purchase, why not take advantage of McCluskey’s online financing application, a feature that allows you to apply for financing, with the McCluskey guarantee that you’ll be approved, regardless of your credit score. Following your approval, call the sales team and schedule a time to come by and take that Chevy you’ve had your eye on for a test drive. The 2016 Chevy Suburban has long proven itself a popular option and the added features and enhancements will likely lure both loyal and first-time Chevy drivers. Perhaps the best part of shopping at McCluskey Chevrolet is the knowledge that your purchase is protected by the expertise of the service department, staffed by Chevy-certified technicians, who know exactly what to do to keep your Chevy running smoothly wherever the road takes you. Featuring Cincinnati’s premier full line body shop, and the Exclusive Lifetime Mechanical Protection program in the Tri-State area, McCluskey’s service team has what it takes to repair any scrapes, minor or major, and ensure that you’re Chevy model is getting the routine maintenance it needs for optimal performance. And while you wait, the McCluskey lounge, modeled after an Internet cafe, is the ideal place to decompress or keep up with the demands of the office, thanks to complimentary WiFi and available iPads for customer use. Keep connected or unplug – while the service team is working away on your Chevy, you can choose to be as productive or relaxed as you prefer. On the subject of preference, the 2016 Chevy Suburban offers a wealth of options and enviable amenities that are sure to have you convinced that bigger really is better. A favorite among families for the ample space and ability to tow summertime toys, like small boats, this year’s Suburban offers some new equipment, in the form of an eight-inch touchscreen, which is now standard across all trim levels and now includes Apple CarPlay smartphone integration. The available Driver Alert package now includes automatic headlights and lane departure functionality. And the top-tier LTZ trims offer an available color head-up display. Aside from those enhancements, the Suburban continues to delight drivers and passengers with its space and surprisingly smooth ride. In the case of the Suburban, more room equals more options. Seating configurations are fun to consider, and should be evaluated based on how many in your crew you intend to cart around. Seating for eight passengers is standard, but you can tweak that number by opting for the available second row captain’s chairs, which drops the capacity to seven, while the optional 40/20/40 front bench seat – exclusive to the LS trim – extends seating to nine. All three of the Suburban’s trim levels – the entry LS, mid-range LT, and top-tier LTZ, all come equipped with a 5.3-liter V8, able to generate 355 horsepower and 383 lb.-ft. of torque, with a maximum towing capacity rated at 8,300 pounds. A six-speed automatic transmission pairs with the rear wheels on two wheel drive configurations or four wheels for four-wheel drive capabilities. This option is certainly a serious consideration for Cincinnati, Ohio drivers come winter time, with its icy conditions. For the middle of the road option, the 2016 Chevy Suburban provides more than average amenities and luxury details, like leather upholstery, power lift gate, heated front seats with driver memory settings, automatic-dimming mirror, nine-speaker Bose sound system, 12-volt power outlets, and automatic headlights. Advanced safety features come standard, courtesy of the Driver Alert package, which includes lane departure warning, forward collision alert, automatic high beams, and a vibrating safety seat. Optional equipment, depending on your needs and preferences, is provided via available Luxury; Texas Edition (available in all 50 states); Sun, Entertainment, and Destinations; or the Z71 off-road packages. But, for all the bells and whistles available on the Suburban lineup, the LTZ features all the equipment from the Luxury package – front and rear parking sensors, keyless entry and ignition, foglights, hands-free access to power liftgate, heated second-row seats, power-folding second and third-row seats, power-folding mirrors, blind-spot monitoring with rear traffic alert, wireless phone charger – and adds it to the LTZ’s upgrades, including: xenon headlights, adaptive magnetic suspension, leather interior, heated and ventilated front seats with extra lumbar support, and ten-speaker Bose surround-sound stereo system. The finance team at McCluskey will help you fit the right trim level into your budget, with pricing beginning at $49,700 for the LS ($52,700 for 4WD); $54,730 for the LT ($57,730 for 4WD); and $64,440 for the LTZ ($67,440 for 4WD). In keeping with current expectations from modern drivers, the 2016 Chevy Suburban comes with all the cutting-edge safety enhancements, with optional equipment available. As a result, the model received four out of five stars for overall crash protection, four stars for front impact protection, and five stars for side-impact protection, following federal safety tests. Fuel efficiency more or less holds true, regardless of drivetrain, with all Suburbans rated at 18 mpg combined, which breaks down specifically as 16 city, 23 highway from the 2WD models, and 15 city, 22 highway from 4WD configurations.